VARRAM Pet Fitness is a friendly, smart pet robot with a mobile application to keep your pet active, happy and healthy while you’re away. Dogs and cats are social creatures, just like humans. Not only can they feel lonely, but they can also have behavior disorders which impair their normal functions. Dogs and cats thrive on companionship and love the company of people and other animals. But what if you’re often away from home? 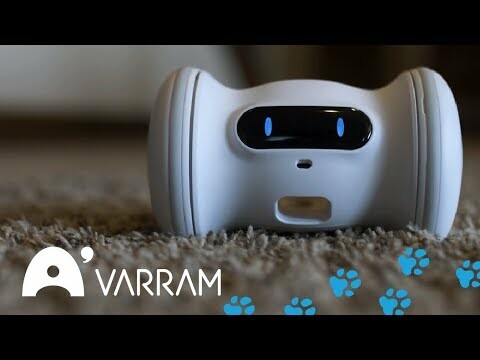 VARRAM Pet Fitness is a robot-like device that plays with your dog or cat by automatically zooming around your home in a fun way, interacting with your pet and dispensing treats. It’s a great way to keep this member of your family active throughout the day, which in turn helps to reduce the risk of lethargy and depression. The clever little gizmo has a radar like system which allows it to dodge and weave around any obstacles. Its also clever enough to know when your pet is close. VARRAM’s rugged construction means it can go over carpets or down the stairs with ease, and deal with quite a beating. In addition to moving automatically, you can control the robot via the accompanying smartphone app. This gives you a means to play with your pet remotely. If you’re spending long hours in the office or simply feeling too lazy to get off the couch, you’ll have comfort in knowing your pet is engaged and active. The app allows you to customize when your pet needs to be active, how many treats they can have and how long they need to play. The Kickstarter campaign to make VARRAM Pet Fitness a reality has received a great reception. Over $130,000 have been raised so far, a number of times over its $30,000 goal. There are still 3 days left in the campaign if you want in. Delivery to backers is expected in January.